Rather than a heathen, most people think Scutt is a design prodigy. 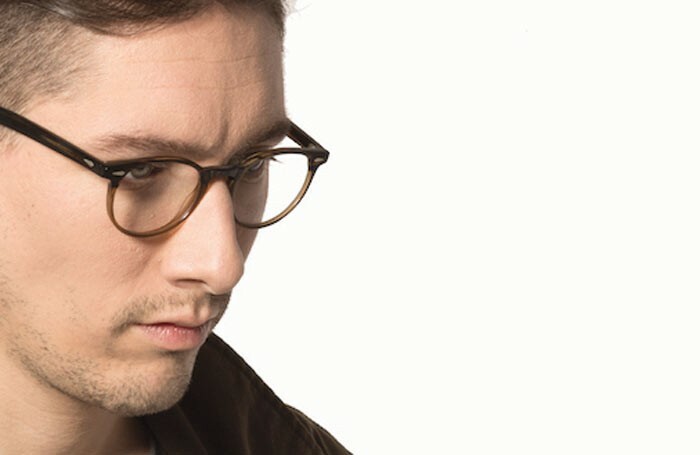 Since graduating from the Royal Welsh College of Music and Drama in 2006, he’s already an established theatre designer at the tender age of 31, with a portfolio that includes work at the National Theatre, Royal Shakespeare Company, West End, Broadway and recently (he’s production designer for the MTV Video Music Awards) Hollywood. He’s also associate at the Nuffield Theatre, Southampton and less than 10 years after winning the Linbury prize, he’s a judge for it. You wouldn’t blame him for being precocious but he’s the complete opposite – bright-eyed and bushy-tailed, and ambitious for sure, but generous too and – in professional journalist terms – a total sweetheart. Since industrial design giant Dieter Rams wrote the 10 commandments of ‘good design’, this moniker has been the measure by which any designer is marked. By anyone’s measure, Scutt is a good designer. 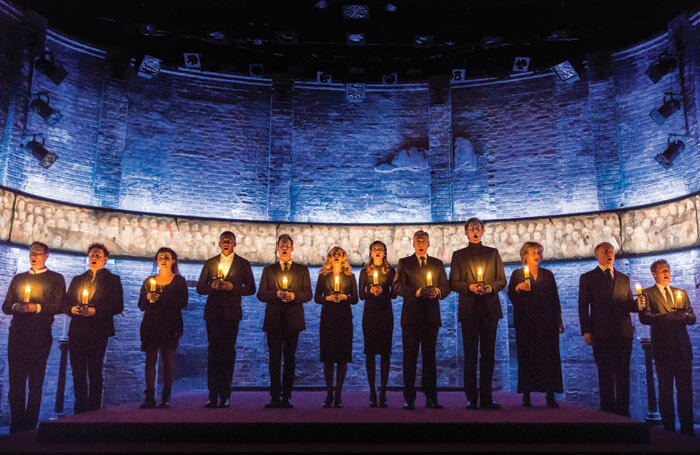 If good theatre design is about talking, he’s a pleasure to talk to – attentive, informed, inquisitive and funny. 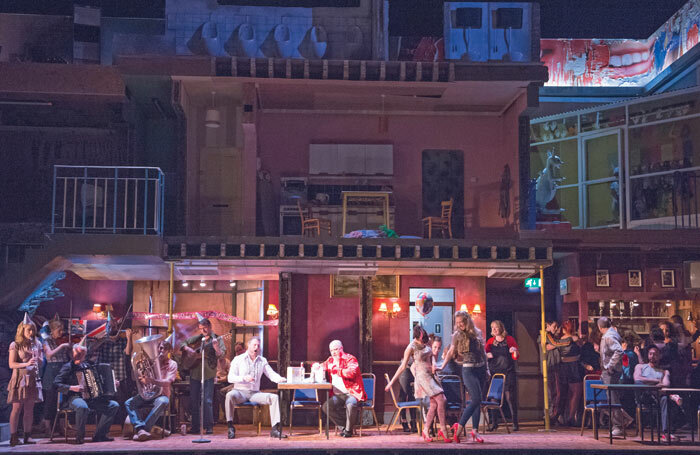 If good theatre design is about creating successful sets – a horribly simplistic way of describing his job that would make him wince – then he does that too. His work illuminates the plays it supports; his cluster of white balloons for Constellations spoke of quantum physics, brain tissue, the joyous feeling of falling in love and the storm clouds that follow. His giant black box for 13 plugged acutely into the claustrophobic, entrapped feelings of both Mike Bartlett’s play on the Olivier’s vast stage and the increasingly bleak vision of austerity-led Britain that surrounded it. His working process for 13 is as illuminating to his own practice as his designs are to the plays he tackles. It’s a way of working that sees design feeding into every aspect of a production, from dealing with the insecurities of an actor at a costume fitting (“There’s a bit of social work going on because, ultimately, you’re representing everyone,” he says. “For the designer and the director it’s a bit like parenting”) to informing the world of the play as much as reflecting it. He’s relishing the chance to be part of a wider organisational discussion at Nuffield as well as the richness of work that results from getting to know and nurturing a long-term relationship with a space and an audience. I don’t doubt his sincerity but with Constellations embarking on a UK tour while wowing New York audiences, King Charles III about to open on Broadway as well and A Number about to begin a run at the Young Vic following a hit run at Nuffield, Southampton, I don’t think he needs to worry about that. Moreover, he’s judging the Linbury Prize only eight years after winning it. He laughs when I point this out, totally savvy to the bonkers brilliance of this ascension. “When I took part in 2007, we had to write a little blurb saying where we think we’d be in 10 years and I said something like ‘the constant shifting nature of the theatre landscape along with the nomadic lifestyle of the designer makes judging where I will be in 10 years an impossibility’. But this rogue comma got printed so it said ‘judging, where I will be in 10 years, an impossibility.’ God it was awful,” he says, grinning at the irony of this editorial mishap. 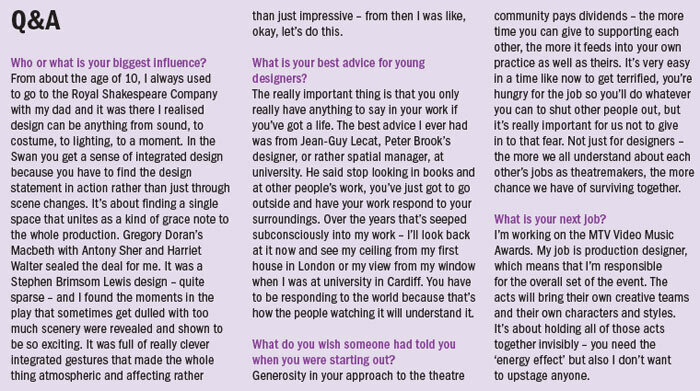 His own understanding of design was shaped by frequent trips to the RSC with his father, an English and drama teacher, and how to bring design into education is something he’s clearly passionate about.